The strength of System Q’s automation platform really comes into its own in traditional specialist industries. The unique flexibility of proven off-the-shelf control components such as I/O and communication devices, teamed with dedicated special devices like process CPUs, assures high functionality, ease of use and targeted control – all within budget. Our dedicated System Q process CPUs build on the already high functionality of Mitsubishi’s advanced PLC CPUs. This powerful combination of sequential control overlaid with dedicated process instructions gives users a hybrid control solution with the best of both worlds. This is complemented in turn by a range of dedicated channel-isolated and highresolution analogue modules. Here, too, a combination of specialist and standard modules provides the basis for practical and flexible solutions. High system availability can be maintained through various means, including redundant process CPUs, stand-by network masters, and redundant network configurations, as well as by wire-break detection and a “hot-swap” capability that allows modules to be replaced during live operation. Programming can be implemented using a wide range of tools such as IEC1131.3 compliant software and the process-dedicated PX Developer. System Q’s Process CPUs bring the benefits of standard System Q technology into the process environment, reducing both implementation and long-term running costs. These powerful processors combine standard PLC control with 52 dedicated process control functions, including loop controls with two degrees of freedom (DOF) and highspeed PID control. Mitsubishi Electric’s dual-redundant CPUs bring an additional layer of fault tolerance to the control of a whole system. This results in high reliability: if the main CPU, power supply or base unit fails, a secondary system starts immediately (within 21ms) from the same control point. For users this has two major benefits: no operational damage due to a single system failure, and production that continues seamlessly. The System Q automation platform can also be applied to other areas requiring high reliability, e.g. 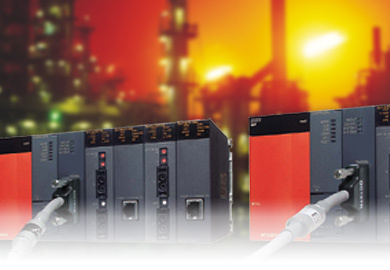 standby network masters, redundant fieldbus (CC-Link) and redundant power supplies for remote I/O stations. In addition, selected analogue and temperature control units have a wirebreak detection feature enabling them to determine the difference between an actual signal and one that has been lost due to external system damage.